The Sarcophagus with Triumph of Dionysus was carved from Greek marble in the second century, it came to Florence from Rome in 1727. On the main side we see Dionysus and Ariadne amid a bacchanalian celebration. There is a train of satyrs (half-human woodland spirits), animals, Pan, and other personalities from Greek mythology. The Roman sarcophagi chosen to decorate the entrance way, that we still admire today, testify to the magnificence of the Medici acquisitions. The two sarcophagi representing Apollo and the Muses and the Triumph of Dionysius were brought to the vestibule from the Hall of the Inscriptions where they had been on display since the time of Cosimo III; contemporarily, the sarcophagus with the Myth of Phaeton was brought to the Gallery from Pratolino. 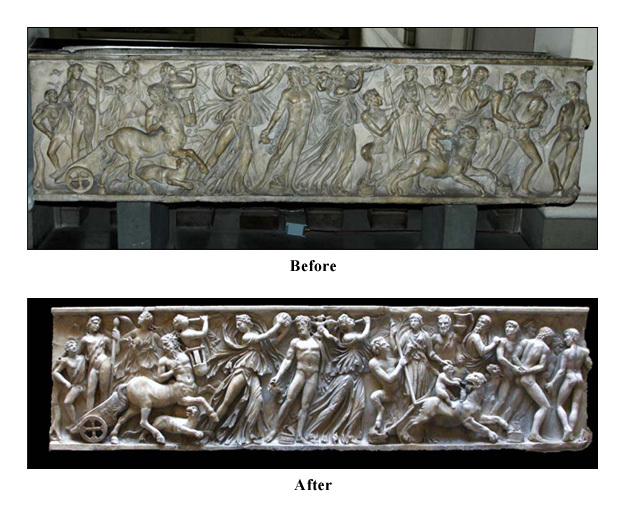 A work of exceptional quality, sculpted in a Roman workshop of the early 2nd century, the sarcophagus had already been copied by artists of the mid-sixteenth century when it was visible alongside the door to the church of Santa Maria in Aracoeli in Rome. The sarcophagus with the Myth of Phaedra and Hippolytus, now more legible after the commendable restoration sponsored by the Friends of the Uffizi, is notable for the extraordinary vivacity of its protagonists: the sorrow of Phaedra as she turns her gaze from her lover; the old nurse as she tries to intervene in favor of the Queen; Hippolytus who is about to undertake the heroic exploit of the boar hunt in the company of a figure whose face might well have served the artists of the Renaissance as a model for the visage of Christ.